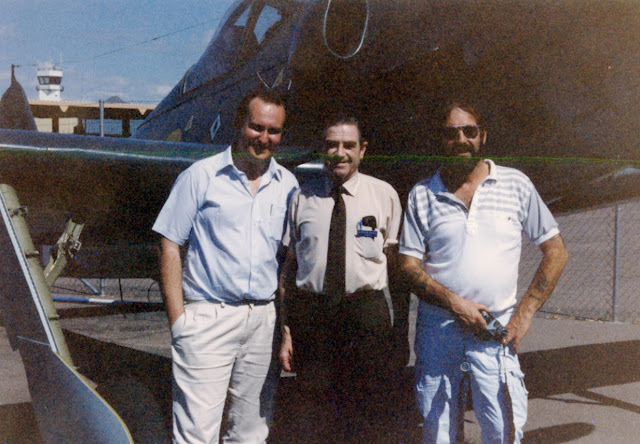 "..with Gerhard Kroll (centre), former Fw 190 D-9 pilot of III./JG 26, and my old friend, Dave Wadman (right), at the Champlin Fighter Museum in Mesa, Arizona, October 1990. Behind us is the museum’s Fw 190 D-13...."
Hello Robert! 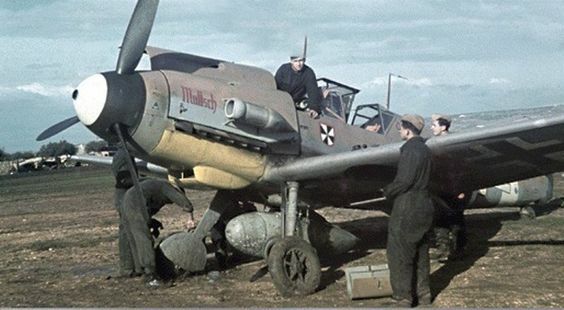 It's great to welcome you to the 'Luftwaffe blog' as part of our author interview series. Thank you so much for talking to us. Thanks too for raiding that old shoe box of photos and coming up with the captions! Right, firstly, how did your interest in JV 44 develop? How far do you want to go back? I had a typical 1960s boyhood diet of Biggles, war comics and war films which sparked my interest in the machinery and drama of the Second World War. When I was nine, my mother took me to see the film Battle of Britain. I suppose that really ‘did it’. I thought the yellow-nosed Bf 109s looked sleek and business-like, and I think I was perhaps sub-consciously intrigued by how the Luftwaffe, led by a buffoon-like Göring in the film, could have successfully invaded most of Europe and be threatening Britain. I then bought endless Airfix kits and my bedroom ceiling was hung with badly made and painted Bf 109s and He 111s. I think there was a lone 1/32nd P-47 which I bought because it was so immense. One day in 1970, I was walking past a local bookshop and in the window I spotted a big book, with a red cover, called Warplanes of the Third Reich. By now I was ten. I walked into the shop, found a copy on the shelf and flicked through it. It was by a man called William Green and it was amazing. I hefted it over to the counter and asked the lady how much it cost. It was very heavy and very expensive. I put it back on the shelf. I went home and asked my mother if I could empty my building society savings account (funded over the years by birthday and Christmas presents) to buy ‘a book’. She seemed to be quietly impressed at her little boy’s literary enthusiasm and agreed. I toddled off, got my money out, but when I told her what the book was, she was perplexed, not a little angry and probably somewhat concerned at her son’s deepening interests in the ‘enemy’. Roll forward to the mid-1980s (in the 1970s and the first half of the 1980s my interests were given over to rock n’ roll, beer, girls and work in that order), I had what was almost an epiphany when I read Johannes Steinhoff’s The Last Chance. I thought it was – and still is – a fascinating and wonderful insight into life on the ‘other side’, when Germany was losing the war, yet had such an amazing example of technology in the Me 262. I then quickly devoured his first book, The Straits of Messina. My first idea was to write a biography of Steinhoff. In around 1986/87 I wrote to the General, but received no reply. I was particularly interested in the story of JV 44 and what ‘actually happened’ and decided, notwithstanding a lack of response from Steinhoff, to start researching the unit with the goal of writing a book. 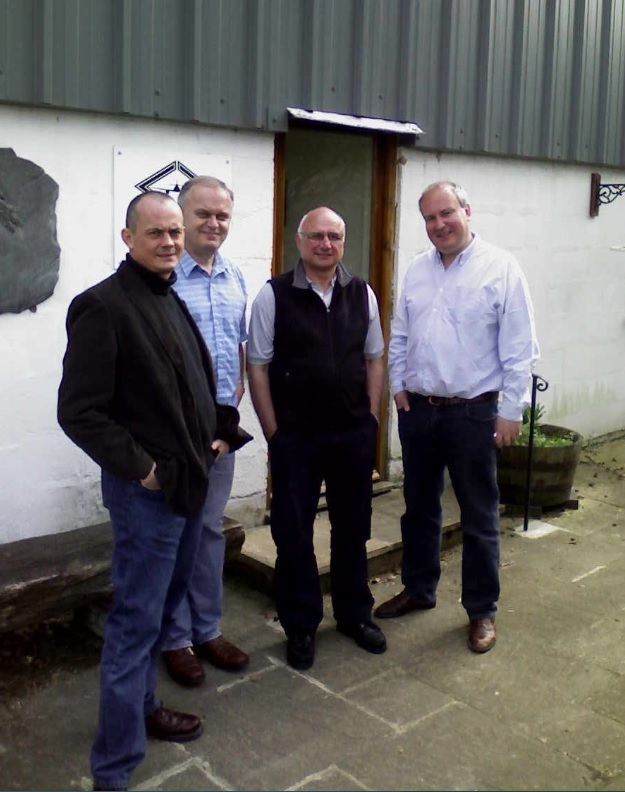 There was no internet or email in those days, so I joined the Gemeinschaft der Jagdflieger as an associate member and went to Germany to the meet the association’s secretary, Horst Amberg, who was very helpful. Through him I was able to contact several former pilots who had been associated with JV 44. I went on to meet and interview Adolf Galland, Walter Krupinski, Hans-Ekkehard Bob, Franz Stigler, Klaus Neumann, Erich Hohagen, Herbert Kaiser and others. I also spoke at length with Eduard Schallmoser who lived in South America at the time. Additionally, I wrote to several German Luftwaffe historians such as Gebhard Aders, Werner Held, Hanfried Schliephake and Heinz Nowarra, not really having any idea what to expect, but it was Manfred Griehl who was most helpful with advice on how to locate documents etc., and I visited him and Hanfried Schliephake. You presumably ran into Eddie during the research for this book? I remember buying the last copy of Monogram Publications’ Jet Planes of the Third Reich by Smith and Creek that Motorbooks in London had in their shop. That would have been around 1986. At that time, it was awesome. Fortunately, it mentions Eddie’s home town at the time in the introduction of the book. I called directory enquiries, they gave me the number and I just gave him a call. He was very gracious and friendly, and it was the beginning of a thirty-year-plus friendship. Eddie invited me down to his home along with a bunch of other UK-based enthusiasts and hosted a barbecue. 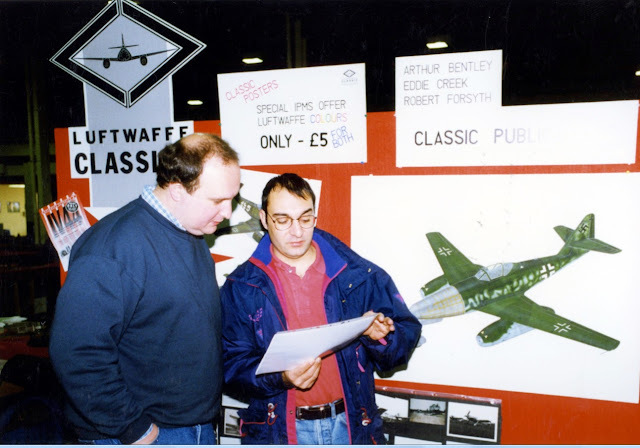 From that, he and Richard Smith set up ‘Staffel 90’ during 1990 as a way of re-establishing ‘Gruppe 66’ the original, but defunct, Luftwaffe research group. It was all a bit loose, but we had all corresponded regularly (by post – no email!) and held a few gatherings. I recall the core group being Eddie, Richard, Martin Pegg, Steve Coates, Nick Beale, Mike Norton, Tom Willis and myself, but we also welcomed Phil Butler, Jerry Scutts, Steve Ransom and Chris Thomas at different times. We used to get together at Eddie’s house in Sussex and would also make mass trips to research at the IWM in London where we were given pretty free reign, thanks to Phil Reed, as well as to what was then the Public Record Office at Kew where if you wanted photocopies you got them on yellow A3 paper and paid 10 pence a sheet. No cameras. Why decide to self-publish and so lavishly, back then it was not exactly the done thing? To be honest, I hadn’t really thought about it. I was still researching the book, and working in London in the shipping industry, doing a lot of travelling. Eddie had just retired. On one occasion, I took a few days off and went with Eddie on our first trip to the IWM document repository at Duxford. It would have been about 1993. In one of those life-changing moments, after a day looking at dusty files, Eddie and I went for a beer in a local hostelry and he asked me what I was going to do about publishing my book. I said I hadn’t the faintest idea. He said, ‘Well, why don’t we do it?’ At first I thought that was barmy, but after a good night’s sleep, the next morning over breakfast, I asked Eddie if he was serious. He was. I wasn’t particularly happy at that point in my day job, and I was very fortunately in the position of being able to afford to take six months off work. I meekly asked my wife if she would allow me to take six months off to write the book on the basis that we would publish it ourselves and I would then return to work. She was wonderful and agreed. We really had no idea what we were doing, but we had the Monogram books as a model, for whom Eddie had written, and a very good friend of mine was an excellent graphic designer. I also had contacts with a small printer in Norfolk. So off we went. I quit work, finished the book and "JV 44 – The Galland Circus" was published by our fledgling imprint, Classic Publications, in May 1996. I was fortunate enough to get an introduction from Adolf Galland shortly before he died, but he never saw the book. I think, in total, in those days it cost a terrifying £30,000 to put together and print a first run of 3,500 copies. 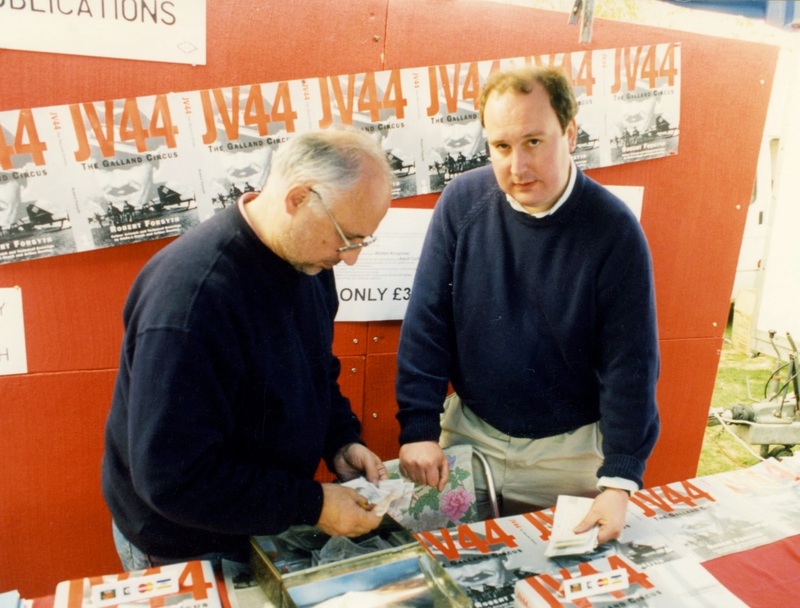 Funnily enough, in the end, exactly 4,400 copies of 'JV 44' were produced. I own the rights to the book and I’m thinking perhaps of doing a revised, smaller format, signed limited edition or POD volume one day. I also wrote about the unit for Osprey Publishing, in which I was able to include the memoirs and photos of Josef Dobnig, which I did not have for The Galland Circus. 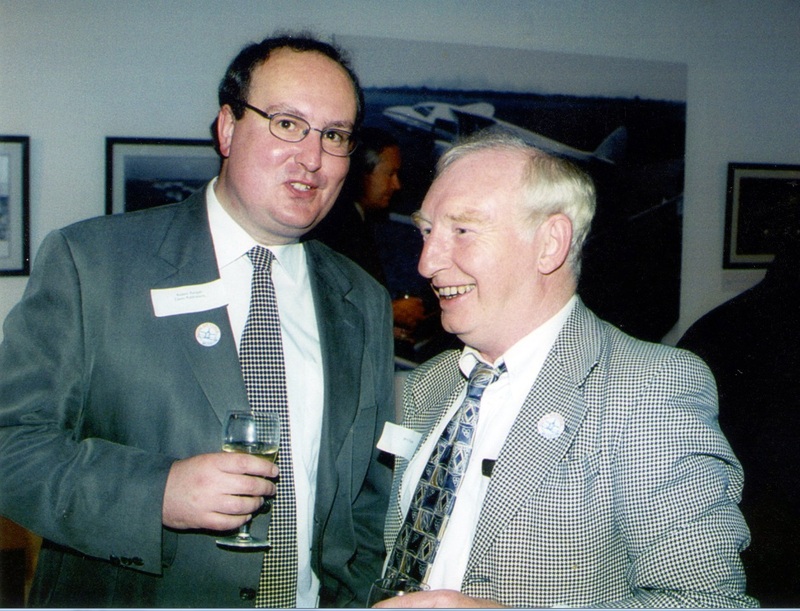 Above ; "...with Eddie Creek at the Duxford Air Show in September 1996. 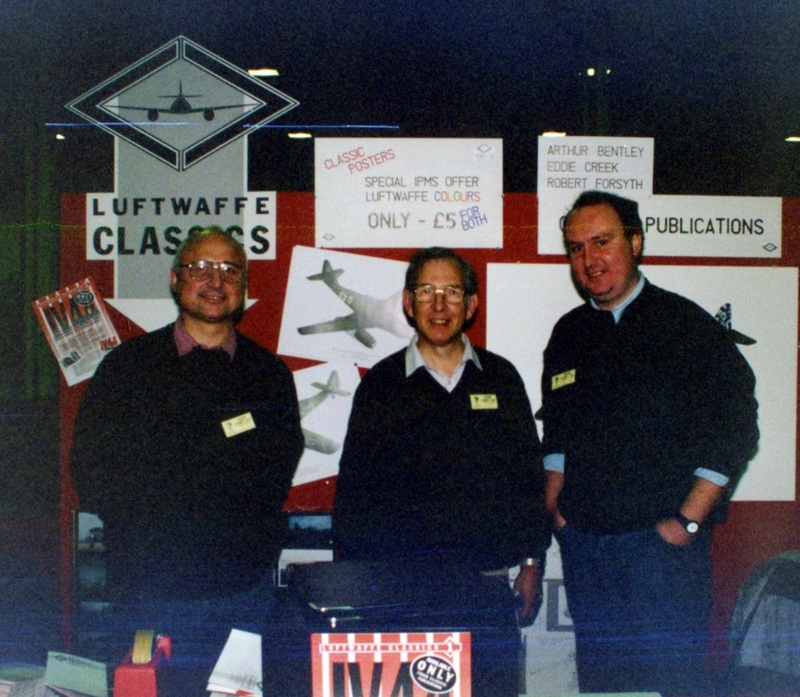 Classic Publications had just launched and this was our second major outing after the Tangmere Aeromart. The Aviation Bookshop kindly allowed us some table space to sell ‘JV 44’...."
Below; "...the original Classic Publications team: from left, Eddie Creek, Arthur Bentley and myself, at the IPMS UK National Exhibition at Telford in November 1996. Eddie built the stand and we covered it with a red tablecloth that belonged to my mother. 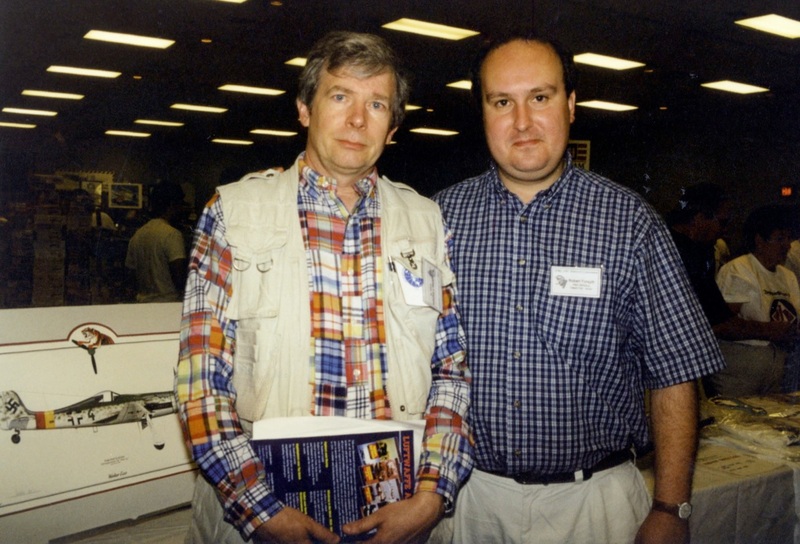 Behind us is some of Eddie’s original airbrush artwork for the book...."
Below; "...with French researcher, the late Eric Larger, who was staying with me at the time and who was a great help in setting up the stand. I remember Eric would give a wonderful, Gallic shrug as he walked past many of the Luftwaffe models, declaring in his heavily accented favourite expression, that their camouflage was ‘completely maaaaad!’...."
Had you already had the idea for the ‘Luftwaffe Colours’ series at that stage? After JV 44 Eddie and I got together with Martin Pegg and published his Hs 129 book and then Eddie’s and Richard Smith’s Me 262 series. I never actually went back to work! The idea for 'Luftwafe Colours ' came a little later. Back in the early 1990s, Jim Kitchens had put me in touch with Eric Mombeek, who I knew from his excellent JG 1 history as published by John Vasco. I got to know Eric quite well and when we set up Classic, he suggested Eddie and I go over to Belgium to meet him to discuss potential projects. It was on the way back home on the cross-Channel ferry from our first visit to see Eric in 1997, that – again over a drink! – Eddie and I came up with the concept of Classic Colours using Eddie’s and Eric’s substantial photographic collections as a basis. At that time, we were also just in touch with Tom Tullis in the States, who was one of the first illustrators to use computer software to ‘paint’ aircraft profiles. So the whole thing was born. It ended up running to 40 titles. Below; "..At the IPMS National Exhibition at Columbus, Ohio in 1997 to where we had shipped a few copies of our second book, Hs 129 Panzerjäger! by Martin Pegg. They sold out within an hour. 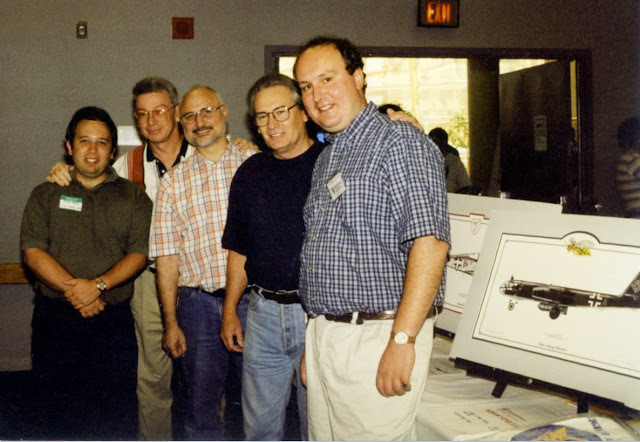 From left to right: model shop owner/wholesaler, Mike Bobe; our good friend and modeller, Bob Hanes, Eddie Creek, Dennis Davison, who is a superb aircraft illustrator, and myself...."
Above; "...at Columbus with my good friend, Dr. James Kitchens. Behind Jim is one of Dennis Davison’s prints..."
Above; " ..with the late Jerry Scutts (right) at a book launch at the RAF Museum at Hendon ca. 1999. 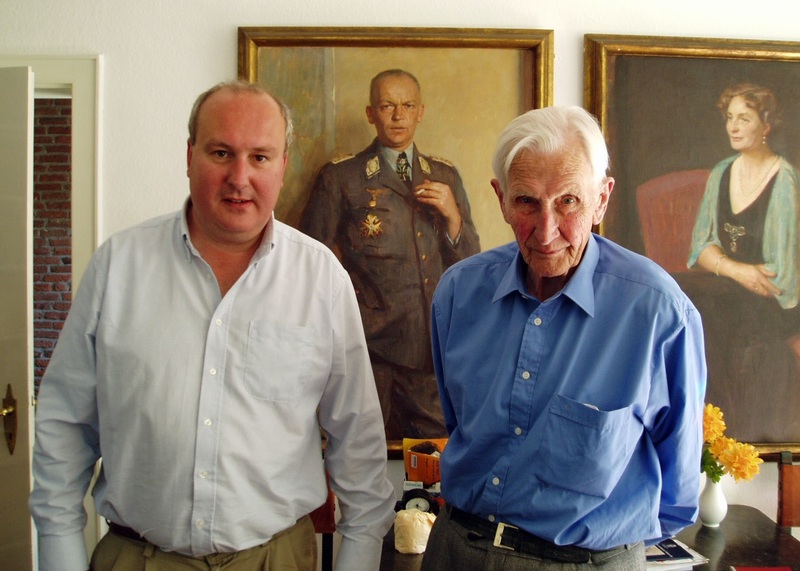 We had just collaborated on ‘Battle over Bavaria: The B-26 Marauder versus the German Jets – April 1945’, a kind of sequel to ‘JV 44’ which came about as a result of a stream of correspondence from former B-26 crews in response to the first book.."
Below ; "..With former Mistel pilot Rudi Riedel of 6./KG 200 during the preparation for my Mistel book, in Bremen, 2000..."
left; "...By the mid-2000s we had taken an office and small warehousing area in a building on my cousin’s farm in East Sussex. Standing outside the entrance to the office is the ‘Classic team’. Seen here with Eddie and myself are my good pals, (far left) Tim Brown, profile and graphic artist, and designer whose illustrations and design is seen in many titles published by Classic and Hikoki, whom we also used to work for; and (second from left) Mark Nelson, a talented designer who has worked on some 100 titles for our various imprints..."
Why has Classic not yet done a multi-part series on the Bf 109? A book per sub-type could be interesting, Emil, Friedrich, Gustav x2 for example? Find me the author willing and ready to do it! Or an airfield series (for example)? We did look at this a few years back, after Classic Publications was bought by Ian Allan Publishing, but we could never get the idea off the ground (I don’t think there’s a pun in there anywhere). Why the (superb and sumptuous) V2 book, since that was not a Luftwaffe weapons system? That was something that Crecy Publishing, who bought Classic from Ian Allan in 2014, approached us about doing. Fortunately, I’d worked with Murray Barber, the author, before on an associated title for my own Tattered Flag Press imprint. He really knows the V2 and is a wonderful guy to work with. Crecy were committed to the book and we had quite a bit of ‘elbow room’ on photo content, which is really stunning. We were also fortunate to be able to work with Mark Alloway, who did the superb colour graphics. I explained to Crecy that the V2 was a German army project, but they felt it was OK to ‘fit’ the book into the Luftwaffe Classics series. What is the book you’ve had to work ‘hardest’ on to get it to publication and why? If you mean to get commissioned, possibly two Luftwaffe titles: the excellent Ju 287: Germany’s Forward Swept Wing Bomber by Stephen Ransom and Peter Korrell with Peter Evans or Nest of Eagles: Messerschmitt Production and Flight-testing at Regensburg 1936-1945 by Peter Schmoll which we bought in from the original German publisher. This is no reflection whatsoever on the authors’ work whatsoever – far from it. They are superb studies, which is why I felt they should be published if at all possible. But it’s hard to get a publisher to invest significantly in books about really specialist types that did not get beyond prototype stage or books about production. Happily however, they did get published. The Ju 287 seems to be quite sought after now on the second-hand market. If you mean in terms of production, then perhaps Camouflage & Markings of the Aeronautica Nazionale Repubblicana 1943-45: A Photographic Analysis through Speculation and Research by Ferdinando D’Amico and Gabriele Valentini. A superb book, but it was very complex and challenging in terms of content and presentation. Happily, most of our projects have been very enjoyable and straightforward to work on. I believe there were discussions with Jochen Prien about publishing his Jagdfliegerverband series in English? Would this not sell well? And some of his other books - the unit history devoted to IV./JG 3 immediately comes to mind for example - should be in English shouldn't they ? They are superb books. When Dr. Prien started work on his Jagdfliegerverband series, we were still working on Classic Colours, so there was a bit of a question as to how they could be presented as Classic books. It was also difficult to get a commercial publisher to commit to a series that was open-ended. There was also the issue of the cost of translation. It certainly needs to be done. How do you feel about your books now selling for hundreds of $$$ in the second-hand market? Other publishers, for example Lela Presse, are just about to start doing limited edition reprints of their OOP titles. Is this something you would suggest that Crecy do? I guess that’s the market. Look at second-hand vinyl records. The same thing. They’re like the new ‘antiques’. Many of our early titles were produced on film which has deteriorated over the years, or they have fallen victim to changes in computer software, so they cannot simply be reprinted. You have to start again. That means those copies of such titles out there tend to fetch premiums. Also some of the early titles did not get to the States in significant numbers which fuels demand now. Crecy have indeed reprinted some Classic titles, such as the Ho 229 and Do 335 (which I believe is about to get a second reprint). What is the future of book publishing in general and Luftwaffe research in particular? Has the internet caused a decline in the amount of magazines and books sold as some suggest? Well, yes..but as far as publishing is concerned though, more and more people will just do it themselves, which is great from one perspective: there are no barriers. The tools are there. When Eddie and I started Classic Publications, there was no email, no internet, no Amazon, no PayPal, no social media, no blogs. We just depended on snail mail and the fax machine. Magazine advertising was prohibitive, but people like Barry Rosch were brilliant: Barry set up the wonderful ‘Luftwaffe Verband’ magazine – which kind of followed on from Gruppe 66’s ‘Archiv’ which was printed on a photocopier! There was – and still is, actually – something of a mystique about the process of publishing, which I have never really understood. Now the tools are there and anyone can publish, as it becomes increasingly affordable, which also includes the development in digital print technology allowing lower runs. There are more private courier mail services and so on. This is fantastic. BUT – I urge a degree of caution. I once attended a seminar at the London Book Fair at which an experienced and respected industry ‘talking head’ pontificated over the question ‘What is the Point of a Publisher?’ In answer, he responded, quite bluntly, ‘Over hundreds of years, publishers have saved the world from millions of crap books!’ There is, I believe, some truth in this. What concerns me, not as a publisher or editor, but as a reader and enthusiast, is that I increasingly read books, both commercially and self-published that contain errors in content – either editorially or in terms of production. Of course, there’s no such thing as a perfect book, but editors, designers, proof-readers, copy-editors and publishers are there to iron these things out and to also take a risk. Are standards in decline? Yes, possibly. As to the future of Luftwaffe research, I have no idea. It would make an interesting discussion. What I am becoming aware of is an increasing and worrying dependency of ‘quick research/quick answers’ on the internet. Having said that, the ability to order digitized documents on line from archives such as the UK National Archives is fantastic. On a slightly different issue, I do think certain official repositories need to get real about the charges they apply to individuals for photographs. But do you find the process rewarding still? To bring an author’s book from concept to publication has always been rewarding for me personally. As a business, we’ve either published or produced some 300 books now – aviation, military, history, biography, motor sport, wildlife and author-funded projects, and I have worked with more than 100 authors around the world, many of whom have English as a second language, but aviation remains my core passion and I just hope we continue to see fresh blood and impetus in our little niche. I am very honoured to be on the Editorial Board of The Aviation Historian which is run by my good friends, Mick Oakey and Nick Stroud. Those guys do a fantastic job and it’s really heartening to see them going from strength to strength as an independent. You’re now doing quite a bit of work for Osprey: can you tell me something about that please? Yes – with three exceptions, I don’t really have any ‘big’ projects in me anymore, so the smaller-scale projects for Osprey suit me perfectly. Nowadays, I spend my time working from home, from where I work on production work for publishing clients (aviation through to self-publishing – we just worked on a wonderful children’s’ book about hedgehogs! 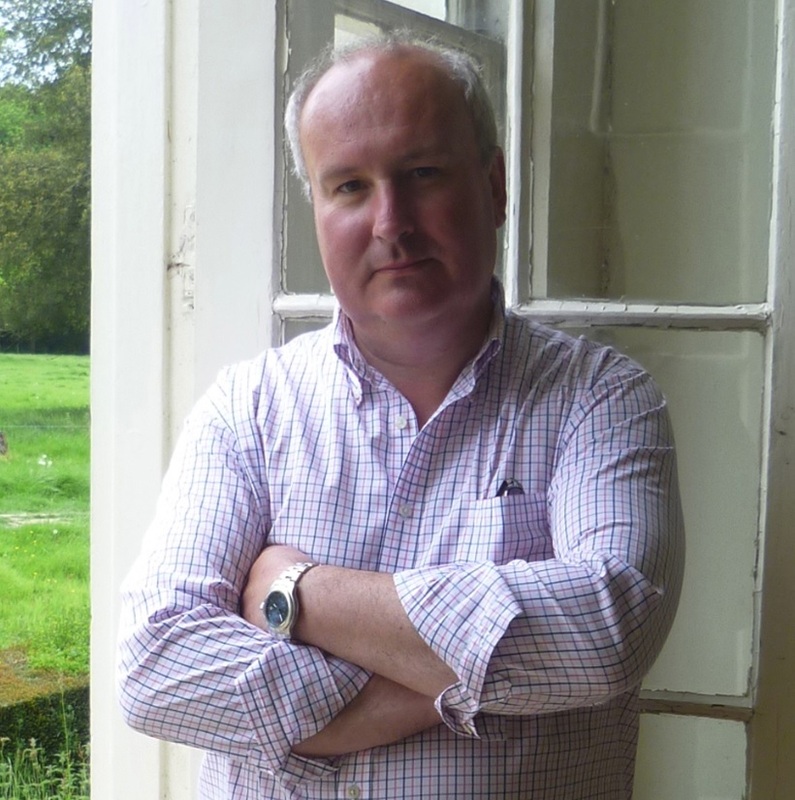 ), as well as getting involved as a consultant in a start-up venture which is very exciting and also writing, of course, which I enjoy greatly. The Osprey books give me a chance to visit (or re-visit) subjects which I would never have done, and I know the guys at Osprey feel strongly that their titles are aimed to a great extent at bringing in new readers by perhaps awakening interest – so I believe they serve a purpose. I remember, myself, the wonderfully innovative Osprey/Aircam series from the 1970s/80s which I still have. 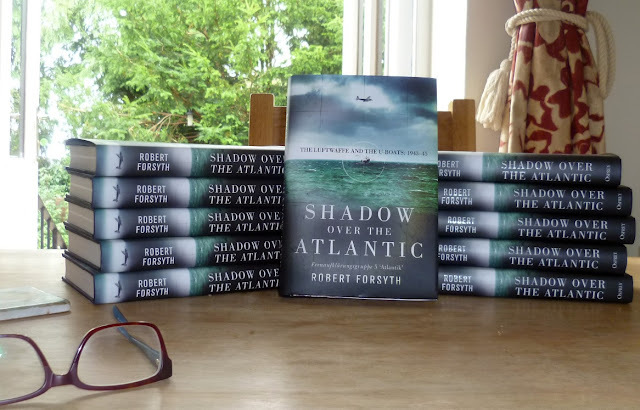 And aside from the various ‘Aces’, ‘Combat Aircraft’, ‘Duel’ and ‘X-Planes’ titles, I was delighted that Osprey gave me a chance to publish ‘Shadow over the Atlantic’ last year which is an account of the operations of FAGr.5. Robert, one final question. Can you tell us what you are currently working on? Well... on a very different tack, I’m working on the history of my favourite band, the Climax Blues Band. I first heard their music played on the British ‘pirate’ station Radio Caroline in 1976 and have loved it ever since. Next year sees the 50th anniversary of the band’s first album, so a couple of years ago I decided that was good enough reason to write a book. It’s been a wonderful thing to do, and I have been fortunate enough that all the surviving members of the band, as well as families, management, roadcrew, sleeve designers and many others have come on board to support the project – and I’ll be self-publishing it! Limited edition, collectors’ item probably. Then I’m also working with Eddie Creek on a detailed history of KG 76’s Ar 234 jet-bombers on the Western Front, based on unit documents, which are amazing. That’ll hopefully be ready in a year or two. Other than that, in a couple of years, I hope to re-start work on the two projects that are very close to my heart: Shadow over England will be an account of the Luftwaffe’s air-launched V-1 offensive against the British Isles and I also want to get back to my biography of Generalfeldmarschall Dr.-Ing. Wolfram Frhr. von Richthofen which I have neglected for too long. When – and if – that gets done, I’ll hang up my boots. 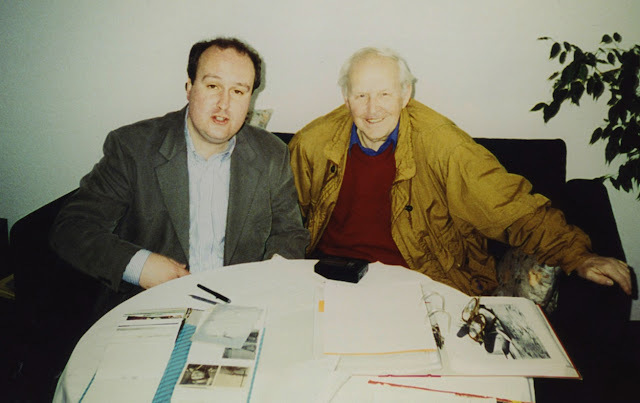 Below; " taken on one of my visits to Götz Freiherr von Richthofen in Hamburg, with a portrait of his father behind..."
Robert, thanks again for your time, for answering my questions and good luck with those projects!
" ...Shadow over the Atlantic – fresh out of the box, 2017..."